RupeeWeb provides the online web platform for accessing the markets. The user interface design and the technology architecture has created an elegant fusion which not only has the rich interface with most easy navigation, it also have a robust technology ensuring quickest access, stability and uptime and live streaming quotes. 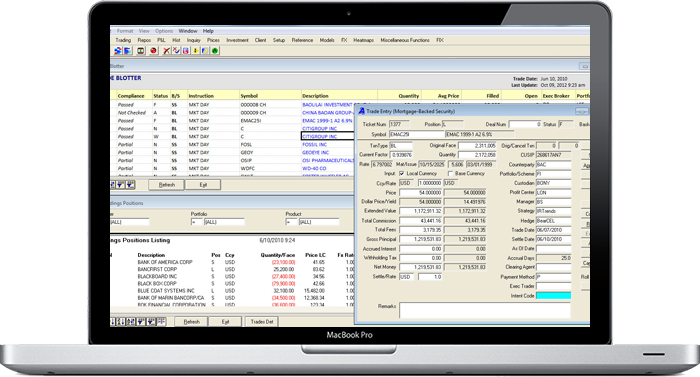 All ledger reports and contract notes are available in one single click. Our online web platform has been designed to ensure that user gets all the information what is needed in the quickest possible manner with minimal clicks. Our web platform stands apart in terms of simplicity, rich interface and the relevant info which we provide to users. Rapidrupee is a very intuitive and feature rich trading terminal which gives the real trading edge to user. For the first time in India we have a trading system which correlates the historical data and the current market data to show real opportunities. 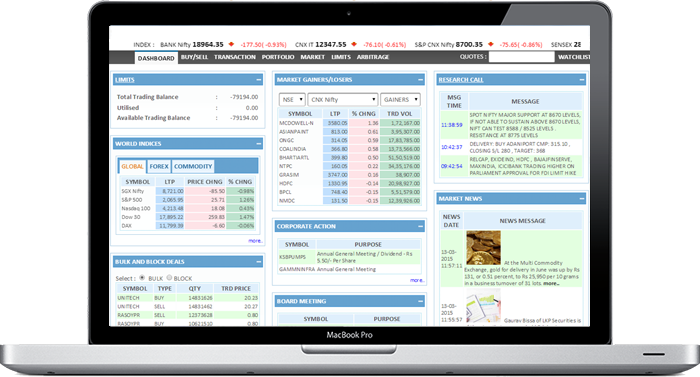 Rapidrupee is more useful for well informed traders and dealers. 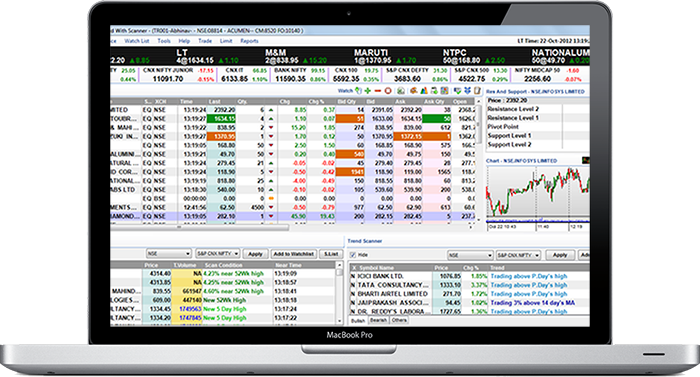 Rapidrupee is a new Analytics driven trading platform meant to give traders and edge. It combines intraday and historical data and has elaborate charts and technical analysis studies. 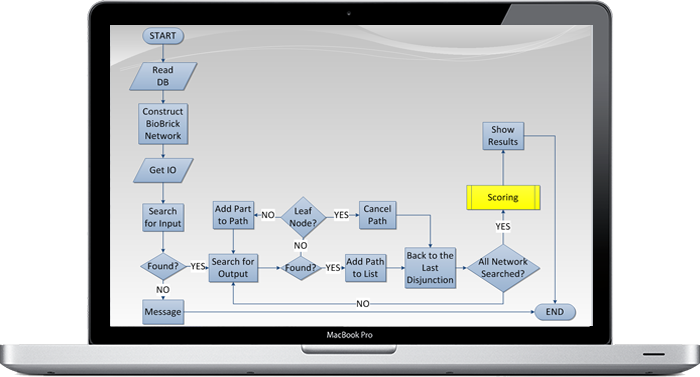 Our powerful framework streamlines the development process from concept to live trading. A huge range of popular technical indicators are built in and can be deployed at ease, RupeeAlgo also has a complete framework for developing custom indicators. 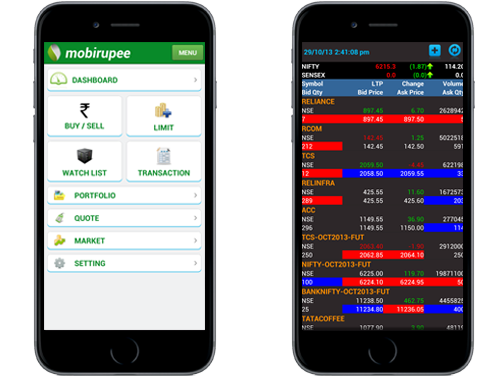 Mobirupee is advanced mobile trading app available in Android, Ios and BlackBerry. Mobirupee provides all the features available in Online Web Platform mobile. It is very user friendly and has a trendy User Interface. It supports multi exchange and multi instruments like Equity, Futures and Options, Commodities Derivatives and Currency Derivatives. Mobirupee can be easily integrated with any other trading platform. With web services and standard API’s the integration is very simple and straight through process. RupeeOMS is a linux based order management system having component based architecture which makes it highly scalable and robust. It is a FIX enabled system providing connectivity to multiple exchanges and handling multiple asset classes. RupeeOMS connects to multiple front ends like RupeeWeb, MobiRupee, RupeeRobo or any third party front end system and provides an integrated order and risk management framework. It has published API through which it can talk to any third party front ends or algo engines. Rupeeseed Technology Ventures Pvt Ltd. (RTVL) is a provider of systems and solution for financial services domain. RTVL provides multi-asset, multi-market trading platforms. What drives us is our obsession to keep our customers happy. Rupeeseed Technologies Ventures Pvt Ltd​.